Being family of 6 (4 children) space is going to be the issue and time and time again I keep coming back to the option of converting a double decker. I had considered the standard options of a Denning with a raised roof however this results in a lot of hard work and expense whilst still maintaining the same floor area. I would be interested in hearing from anyone who can guide me here on the pitfalls that I may not have thought of to date regarding a decker. What sort of money I should budget to purchase one. 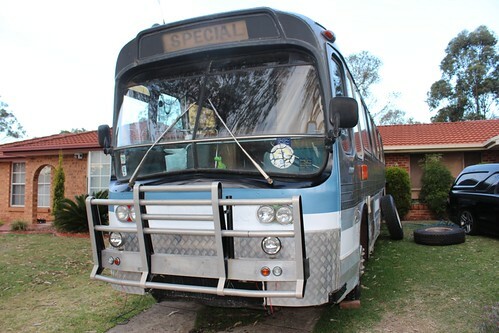 About six months ago I say 4 in QLD selling on eBay for $30k and I now see the same buses listed for $71K so I'm willing to wait and get a good one at the right price. From what I have learnt so far there are mainly Denning Landseer & Volvo B10M Double Deckers. One of the restrictions I would be looking into is where you plan to stay while travelling? If it is free camp style grounds you should be right but if it is more caravan park style there might not be to many parks that will welcome you. I have seen a few single deck coaches that have been fitted out to fit a family of 6 or more. Basically double/queen bed up the back then 2 sets of bunks on each side, then bathroom-living room kitchen etc. Good luck either way, i would love to convert a DD I the future. Do you mean a bus would not be welcome due to it's size or a double decker due to it's height? I am interested in finding some examples of single deck bus converted for 6 as you described above. A single decker such as a Denning Lanseer would be my preference for a first time conversion however I am concerned that it would require a raising of the roof and then it becomes more of a project than I envisage a double decker fit out would be. I suspect that once the roof gets cut off and the skins removed then there's 6+ months gone. I want to be touring and living the dream and not working on my conversion for 3+ years Have you decided to raise the roof on yours? I have an Austral Tourmaster fitted out for a family of 8, (6 kids and 2 adults) , no raised roof, and we have enough room. From the back, cupboards on the back wall, queen bed, 3 bunks on each side, toilet on passengers side, bathroom on drivers side, then kitchen, then 2 sets of bus seats each sisde facing each other with table in the middle. No "lounge" but it doesnt bother us as we travel to see things other than the inside of the bus. I think you just became my new best friend. This is almost exactly what I am after. Was thinking of 2 bunks on either side with drawers underneath. Is you dining 2 seats facing 2 seats with a table between on both side of the bus? i.e. 2 tables with an isle in between? How do you go for storage? Do you drag a trailer? I'd love to see some pics if possible. Those Scanias were great to drive. Young kids would love the bunk behind the driver's seat. Single deck build without a roof raise would all depend on how tall you are. I'm 6 foot, (1800mm or thereabouts) and I couldn't walk down the isle, (drop down isle) in my Austral Tourmaster without bending the neck. Haven't stepped foot onto a double decker but would imagine it would be similar. Speaking to a coach company boss a few months back he said that decker a had a slightly lower roof, compared to a standard landseer. I stood in a denning denair and there was just enough room to live with, I'm just over 6 foot. When I get mine, denair or landseer, I probably won't raise the roof or flatten the floor. Plan I to do a basic fit out and get on the road ASAP. Then rebuilt and refit it after I know what works where and do the roof lift of needed. We toyed with the double deck idea also, but thought that there are bound to be small country towns out there with overhead power lines that will cause problems and long detours to get around... Not to mention underpasses and low rail bridges.. That's partly why we ended up with the single deck. As for height, I must be short, I can stand up in any bus I've been in! "MORRIS QUALITY ENGINEERING - putting oil back in the ground for the last 80 years! " 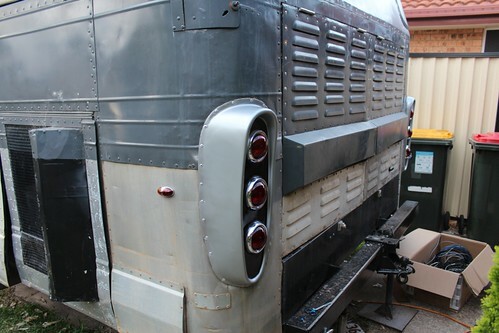 "We have 4 kids also , and we ended up buying a ex pioneer ansair Scenicruiser coach"
Can we have an exterior picture of her please? Presumably you mean an Australian equivalent of a London Double Decker bus? If so, which era? Front engine or rear engine? You would probably have to go to England to buy a real one. boronia wrote: Presumably you mean an Australian equivalent of a London Double Decker bus? If so, which era? Front engine or rear engine?